As the Dacian society and their artistic expression was excessively moderate in the display of its own values, the thinking frame, at least of the man of arms, can be completed with the analysis of the weaponry, when it is decorated or ornamented. 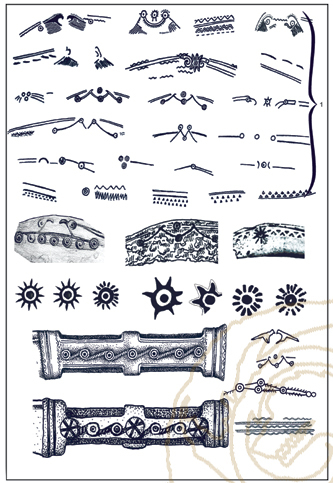 Even if this type of information is precarious whether because of its scarcity, or because of its deficiencies and difficulties of interpretation of the ornamentation, the analysis of the decorated weapons offers a one more window towards the backstage of the military elites` self-image in the Dacian Kingdom. The authority is a social concept articulated by a complex set of symbols, which codifies specific ideas that the individual wanted to project around him. Without doubt that the Dacian warriors used to display its own martial value by exhibiting its concrete symbols, the weapons, as a way to impose the authority and as a form of communication with its social structures that enveloped them on all levels. The weapons were one of the most visible way to express the warrior ideology and identity, the military elites having a specific arsenal, efficient and numerous, true emblems of military power and economically potency. Such a full of personality weapon was the shield (Fig.I). The graphical or compositional analysis would be incomplete if we were limited to the archaeological document. Mainly realised by perishable materials, from the shield all that was preserved were the metallic pieces, the central umbo, rarely, pieces of the edge and sometimes, some rivets or nails. But the documentation is completed by the Roman iconography that illustrated on the Trajan`s Column the warriors on the Danube, equipped with their shields. Almost 400 such pieces displayed on the entire monument, frequency that denotes the actual importance and the generalization of this weapon, highly ornamented. Of course, a first impediment would be the stepping over the barriers, clichés and stereotypes of the imperial art, susceptible to distortions with various motivations. Yet, each shield is personalized with its own ornamentation and, although apparently it existed a registry of models, there are no two shields alike. It is hard to determine if the ornamentations were painted or they were metallic bands for decoration and reinforcement1, but the hypothesis is that there was a combination between the two possibilities and that the diverse colours and combinations used, represented identification elements, next to the metallic ornamental reinforcements made. A special note is worth the detailed observation of several umbo-s displayed on the base of the Column. These components are extremely elaborated graphically, with a diverse and complex ornamentation. One could suspect possible interventions and fabulations of the Roman artists, if the graphical models wouldn`t be identical with some originated in the area of Sarmizegetusa, where were discovered metallic ornamentations with decorated heads, sometimes extremely similar (Fig.I/3). The conclusion would be that the sculptors possibly hyperbolized some details but having within sight the Dacian models2. The displayed weapons on the pedestal were some of the most precious spoils, far from being simple pieces of weaponry. They expressed, beyond the quality of trophy, in great extent the spirit, personality and ideology of the defeated. It is to be noted the visible discrepancy between the small numbers of components indubitably associated with the shields, discovered on a large area and the one of the iconographic sources, dominated by the Roman images. Of course, the funerary contexts from which come most of the metallic components the resisted are rarities by themselves, situation aggravated by the funerary discretion of the 2nd c.BC - 1st c.AD. In this frame it is possible that the shields, in the shape and their complete decoration, not to have been accessible to all the categories of warriors, but only to the elite3. A well-made shield, technically and aesthetically elaborated and which contained a certain graphical composition, couldn`t be worn by anybody. The shield represented and reflected under this aspect, in the most visible way, the identity of the owner and his affiliation to a certain socio-professional level (Borangic et alii 2015, p.126-127). Another source regarding the ornamentation of some weaponry pieces, also indirect, because it also arrived to us through the filter applied in the Roman art, is the diverse ornamentation of the helmets present on the Trajan`s Column (Fig.II). These pieces of equipment, which, not even now are not accepted as belonging to the Dacian weaponry by a part of the historians, are decorated with zoomorphic elements (ram heads), fantastic (gryphons) or human (Hercules?). Much more discreet under the aspect of the sent message are the ornamentations on the blades of the aristocracy`s curved daggers (Fig.III/3). These weapons compensate by their large number (Sîrbu, Borangic 2016, p.64) and especially by the link beyond any suspicion with the Dacian warrior aristocracy (Florea 2004). These specific weapons, of the highest social positions, were an image vector with a much more complex spectrum than the weapons, this way, the possession of a weapon was visible without problems, the messages or the spiritual load contained in the blades` ornamentation was much more discreet, accessible only to a small circle. On the blades of the daggers were incised geometric and zoomorphic motifs (Fig.IV), abstracting that implies the existence of a certain code, understood only by the competent members of the group. The function of the ornamentation in the warlike ideology is given by the frequency with which they were found and the large area on which it was spread (Florea 2004). Most probably, the ornamentations had a strong apotropaic load, and, in the same time, it is possible to have been an emblem that underlined the appurtenance of the owner to a warlike brotherhood or to demonstrate a certain social status. The engraved symbols on the blades of the daggers offered a spiritual bind to the warrior in relation with his social medium, transposing in the material world the set of existing spiritual links between the members of the group, the set the individual in a network of well-defined relations and excluded the feeling of loneliness. The incised symbols are obvious specific, with no identical decorative combinations. This way, even if they belong to a common ideology, the ornamentations themselves are extensions of the individual`s identity, detached by the group through these signs, which personalized his characteristic weapon. The aspect is even more important if we look through its magic component, because it shows a change in the way to relate with these warriors with the fantastic plane of the existence. The engraving of the weapons was, in fact, the attempt to constrain the transcendental forces, with the purpose to impose, to enforce certain favourable conjectures or to modify the unfavourable ones (Sîrbu, Florea 1997, p.37). The recurrent decorative motif used is the circle, sometimes with a central point, alone, or together with other similar circles, or punched. This symbol, solar by definition, was frequently accompanied by zoomorphic schematized ones (mainly birds), completed by some specimens of grooves made of small triangles punched along the blade. Deciphering these ornaments received multiple orientations and explanations. If certain circular signs can be easily associated with the solar symbolism, the rest of the schematizations couldn`t be interpreted so unequivocal. As general principles, reported to the spirituality of the epoch, the iconographic subjects can be related with themes centred especially on the of the bad-good antithesis (face to face birds), or based on the celestial-telluric antithesis, expressed through couples of birds/snakes4 (Fig.III, Fig.IV). Anyway, in the case of zoomorphic representation, it is possible that the intention of the graver could have been, most probably, the representation of pairs of pray birds. Birds generally, but especially eagles, rulers of the sky, were the only ones that could watch the Sun in its face (Plinius, Naturalis Historia, X, 3), reason for which, they held a special place in the landscape of the Thracian and Celtic semiotics (Sîrbu, Florea 1997, p.53). As possible, these aviary stylizations could have tried to reproduce swans, birds associated to solar cults and of the god Apollo, religious manifestations yet undeciphered in the space under discussion. The strong schematization of the presented themes in the iconography of the dagger blades transformed the symbols in ideograms of certain myths that entered the collective consciousnesses to which their owner belonged to (Florea 2004) and at the same time, through the appeal to the zoomorphic iconography, they realised a reference to the virtues of some animals whose rapacious behaviours were accepted and cultivated models in the epoch. A good example in this sense can be observed in king Scorillo`s stratagem (Frontinus, Stratagemata, I,10,4), who to convince his compatriots of the inopportunity of an attack against Romans, he associates a wolf to his own warriors (Sîrbu, Florea 2000, p.214). The animal was so included and present in the collective mental, that the Dacian king could, through the fight scene, manipulate his chieftains without using any other strategy. Although harder to be included in the category of backgrounds, it must be reminded also in this registry, the incised signs on certain Sarmizegetusa type curved swords. Initially, it was identified a punched sign with a shape of a point inscribed in a circle (eventually resembling the Greek letter) only on the tip of such a sword (Borangic 2015, p.181) (Fig.V/1 a-b). Even such symbols appear also on the sica daggers, the particularization of a sword in the way in which the daggers of the aristocracy were decorated, even possible; it was debatable, such that the most probable explanation was that the sign was a trademark of a blacksmith or workshop. But recently, in the area of the village Ursici (Hunedoara County) were discovered several weapons, among which a sword and a whole falx dacica, as well as the tip of another one. On the tip fragment was engraved the same sign (Ferencz et alli 2016)5. Such symbols also appear on the blades of sica daggers, the particularization of a sword in the key with which were decorated the daggers of the aristocracy, indicates a common or close ideology between the members of the warrior aristocracy -tarabostes- and professional warriors - comati/capillati, socio-professional category inferior to the nobility, but base component of the warrior elite from the Dacian Kingdom. The Dacian war-like elements resorted to a sum of symbols of power at their disposal, and with whose help, they projected their image and ideology in the territory, both on social vertical and the martial horizontal, among the group. These symbols suffered modifications in time or their meaning seems different or distorted to us, now, in relation to their initial message. The military elites stated their authority both by force, often the only way of expression, but also by image. Even this type of informing source is precarious, whether because of scarcity, or because of deficiencies of interpretation, it cannot be eluded, offering a window towards the backstage of the power of the warrior elites. Even if the brute force resolves, partially, the reports between the elite and the rest of the society would be too simple to merge in this scenario the entire sum of existing relations between the two social components. Without doubt, the exercise of the power in concrete plane was an in-extremis solution. As a prelude to imposing certain commands, the elites showcased their own martial values by displaying their concrete signs, as a way of imposing the authority. The weapons, expressed by number, quality, value or origin, have always radiated efficiently the image of authority in territory, so that the short radiography of them is necessary to understand the military phenomenon that led to the edification and existence of the Dacian royalty. The emergence and the imposing of a certain identity model, expressed by a sum of distinctive elements, repetitive and identifiable on a large chronological scale prove the standardization to a way of expression and, in the end, of a life style. The value, quantity, morphology, influences, adaptations, quality and elements that define the man of arms are all parameters that converge to the mentality of the military elites in the times of the Dacian Kingdom. Otherwise said, the identified iconography on the weapons of the Dacian military elites is part of the self-image of these men of arms, a complex image offeree and art. 1 This hypothesis is suggested by the discovery of several narrow iron sheet fragments in Sarmizegetusa Regia area (Glodariu, Iaroslavschi 1979, p.130). The lack of the drawings, due partly to the poor conservation status of the metallic remains, does not allow a certain identification of the functionality of these remains, this way left unpublished, only partly mentioned. 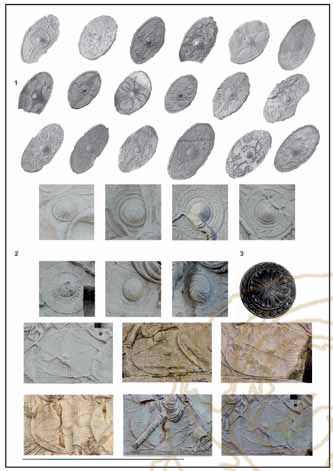 2 Resembling decorative models are used also on several Roman coins (aces and sesterces), that use Dacian shields as iconographic themes (Borangic 2015, p.73, Pl.XIII/7-8). 3 It is possible that the warriors less rich to have been protected with shields made of wattle, or tree bark, or wood covered with thick Leather, lighter but less efficient, also used by surrounding tribes (Herodot, Istorii, VII, 75; Aristofan, Axapnh, 160; Clemens from Alexandria, Stromata, 1, 16, p.132; Strabon, Geographia, VII, 3, 17; Caesar, Commentarii rerum gestarum belli Gallia, II, 33). These shields, must have went out of use in parallel with the emergence of the re-curved bows, that could generate sufficient force to penetrate them, helped by the specific shape of the heads and especially once the Dacian armies became professional on a large scale, professionalization that democratized the use of the re-curved bows. 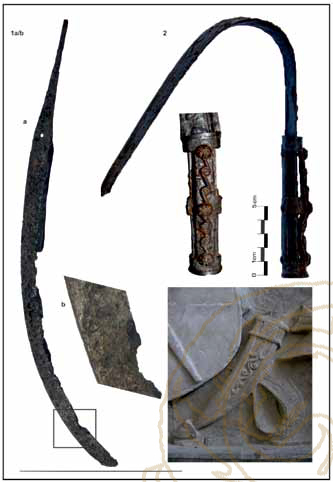 4 The only ophidian representation on these weapons appears on a dagger discovered at Rast village, Dolj county, Romania (Sîrbu, Borangic 2016, p.86-97, fig.15/5, fig.28/5). 5 A similar sign is incised on some axes from around the Piatra Roşie citadel (Sîrbu et alii 2005, p.50), clue that brings out those pieces from the area of simple tools. 4. Base of the Column. Captured shields (photo R.D`Amato). 1. 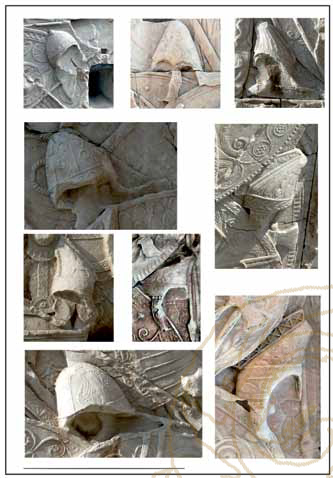 Different types of helmets represented on the base of Trajan`s Column (photo R.D`Amato). 2. Decorated curved dagger and scabbard. Corcova village, Mehedinţi county (photo V.Sîrbu). 3. Pergam, Turcia. Sheath of a curved dagger represented on the frieze of the Athena`s temple, Pergamon Museum, Berlin (photo V.Sîrbu). • Borangic C., 2015, Dacorum Falces. Armele încovoiate ale dacilor, Editura Academiei Române, Centrul de Studii Transilvane, Cluj-Napoca. ISBN: 978-606-8694-31-3. • Borangic C., Marcu M., Barbu M. 2015, Reconstrucţia unui scut din epoca dacică. Consideraţii de ordin istoric, tactic şi structural, Acta Musei Porolissensis, XXXVII, p.113-170. • Ferencz I.V., Bodo C., Balos A., 2016, Arme dacice provenind de la Ursici (com. Bo$orod, jud. Hunedoara, Acta Musei Porolissensis, XXXVIII (forthcoming). • Florea G., 2004, Imagini proto-istorice, Orma, 1, 2004 (http://www.orma.ro/wp-content/uploads/2008/10/7_ gelu-florea.pdf 07.11. 2015). • Glodariu I., Iaroslavschi E. 1979, Civilizaţia fierului la daci (sec. II î.e.n. - I e.n. ), Editura Dacia, Cluj-Napoca. • Rustoiu A., 2001, Ornamentica pumnalelor curbe traco-dacice, in Studia archaeologica et historica Nicolao Gudea dicata - Festschrift für Professor Nicolae Gudea Gelegentlich des 60. Geburstages, Zalău, p.181-194. • Sîrbu V., Borangic C., 2016, Pumnalul sica în nordul Dunarii (~200 a.Chr. - 106 p.Chr.). Semiotica marţială a puterii, Editura Istros, Brăila. ISBN: 978-606-654-188-6. • Sîrbu V., Florea G. 1997, Imaginar şi imagine în Dacia Preromană, Editura Istros, Brăila. ISBN: 9739846009. • Sîrbu V., Cerişer N. Romulus V.I., 2005, Un depozit de piese dacice din fier de la Piatra Rosie (sat Luncani, com. Boşorod, jud. Hunedoara), Editura Altip, Alba IuLia. ISBN: 973-7724-67-4. • Woźniak Z., 1974, Wschodnie pogranicze kultury Lateńskiej, Polska Akademia Nauk, Instytut Historii Kultury Materialnej, Zakład Narodowy im. Ossolińskich, Wrocław. Dacian warriors displayed their martial value by exposing insignia, as ways of imposing the authority and communication with social structures. The weapons were one of the most visible means to express the ideology and warrior identity. Connecting the historiography with archaeological and iconographical sources, shields, helmets, daggers, swords are revealed artistic expressions, real windows towards mentalities and warrior codes. The schematic, incised decorations on the blades of the sica type daggers, become ideograms of certain myths, as part of collective consciousness from which their owners were part of. The zoomorphic iconography was created as a reference to the virtues of animals, whose rapacious behaviours were accepted models in the epoch. 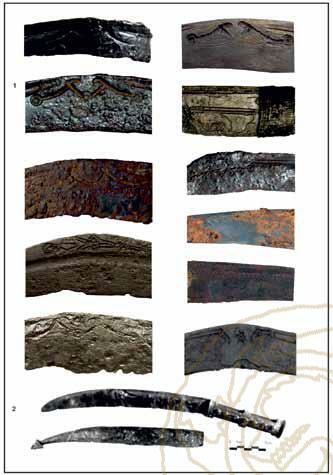 Decorated weapons of the Dacian warriors offer the possibility to enter the world of these too obscure warriors.